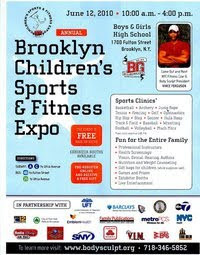 There will be professional instructors, health screenings, exhibitor booths and gift bags for children (while supplies last). So hurry and pre-register online by clicking here or call (718) 346-5852. If you would like to volunteer for this event follow this link and join me as I too will be volunteering for this great and meaningful event. Do it for the kids!